Robin is an Associate in the Litigation Department. Robin advises principally in relation to civil and commercial litigation, currently specialising in personal injury claims, acting primarily for the Plaintiff. Robin also has experience in employment, trust, and general contractual disputes. 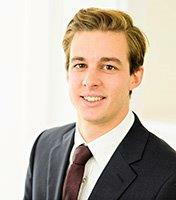 Before joining AFR Advocates, Robin practised at a global offshore law firm, specialising in cross-jurisdictional trust disputes and insolvencies. He has also worked at the Office of the Children’s Convenor in Guernsey, advising on public matters relating to childcare and youth justice.